True Opt-OE components can be a way for OEMs to compete with aftermarket pricing without straying too far from the genuine, new OE part ideal. The different OEM programs can create confusion in the collision repair industry and leave the door open for a “grey market” of parts purporting to be “Opt-OE” but potentially far from the quality of an officially sanctioned OEM program. Whether the supplier knows it or not (the confusion probably exists there as well), such so-called “Opt-OE” parts could in fact have been stolen, counterfeit or not intended for that region (as one repairer experienced). To help clear up this confusion, the Society of Collision Repair Specialists earlier this year polled several major automakers about their Opt-OE programs and recently shared their email responses with Repairer Driven News. Armed with this information, body shop employees will have a better chance of weeding out dubious Opt-OE sources and ensuring that the alternative part ordered truly has the OEM’s blessing — if not always their warranty. FIA doesn’t offer any officially sanctioned alternative FCA parts. So if anyone claims to have Opt-OE Fiat or Chrysler parts, be very wary. Ford powertrain and collision product marketing manager Paul Massie wrote that Ford’s Opt-OE parts are offered through the standalone, independent OE Reman Direct program. Such parts are sold to “OERD” through authorized Ford affiliate Ford Component Sales, Massie wrote. Massie referred SCRS to William Bejin of OE Reman Direct, who further explained OERD’s definitions and its parts’ pedigree. Refinished: Such parts were blemished when received by OE Reman. The company has “refinished them by etching the factory finish off and priming the cover with two coats of waterborn primer,” Bejin wrote in an email. Surplus: “Parts that we have received from Ford that have no blemishes and require no repair,” Bejin wrote. The parts themselves are kept in Monroe, Mich., and sold exclusively by participating Lincoln and Ford dealers. “We send the dealers OE Reman inventory to CCC, Mitchell, Audatex, and a number of other smaller estimating systems and part search engines on behalf of the dealer,” he wrote. 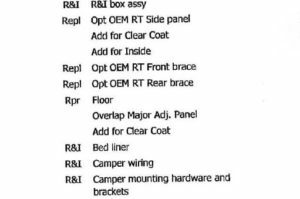 The parts have the Ford service number but include an “R” suffix for refinished parts and “REC” for surplus, according to Bejin. They’ll show up on the information providers as “surplus,” “reconditioned” or “Alt OE” depending on the service, he wrote, and he noted he hadn’t seen an IP with a “refinished” definition. “The nature of what we are doing is a hybrid between multiple definitions,” he wrote. GM Outlet Shop manager Daniel Schell also elaborated further on the program in emails to SCRS. Perhaps most notably, he wrote that the parts aren’t warrantied and only are sold through the GM dealer network. Like FCA, Honda doesn’t technically offer Opt-OE parts. However, “conquest” parts might be designated as Opt-OE in an estimating service, which complicates things. “Honda does not have any ‘blemish’ parts or ‘seconds’ or anything of that nature,” wrote Gary Ledoux, Honda assistant national manager, collision parts and service marketing. “We only have original equipment Honda / Acura Genuine parts. So if the part advertised by a supplier as “Opt-OE” doesn’t appear to be a conquest part, be wary. “We do however know there are counterfeit parts out there and are doing all we can to identify the parts and their source, alert the proper authorities, and prosecute them,” Ledoux added. Hyundai has an OEM alternative parts program, Car Care Parts, Hyundai confirmed in November 2015. However, it only includes mechanical repair components (e.g. brake pads and rotors), not collision parts. For the mechanical repairers who were wondering, the Car Care Parts components are created and distributed by Mobis and carry a unique part number with an “S” prefix. They’re warrantied for 12 months or 12,000 miles. “I’ve been trying to find out what Opt-OE is myself,” a Mercedes-affiliated audience member said at the Collision Industry Conference on April 22, 2016. Mercedes doesn’t have an Opt-OE or Surplus OE program, he said, so it was unclear what was being listed as such on the estimating platforms. “We don’t know what that is,” he said. Nissan calls the parts Value Advantage, Zoba wrote, and the components are “OE engineered and source parts with second line suppliers.” They are only distributed by dealers and have unique part numbers. Infiniti Opt-OE parts appear to be handled in the same fashion. In response to a query about whether Opt-OE parts on an Allstate estimate were sanctioned through an Infiniti program, Zoba stressed that official Opt-OE parts will only come from an Infiniti dealer. Citing answers from wholesale parts and collision manager Jeff Hilton, Toyota wrote in an email that it doesn’t have any formal Opt-OE programs. Since it doesn’t, be very wary if you see one advertised. “There is definitely some confusion across the industry regarding the use of the term ‘Opt-OE, and the types of parts it represents and where they come from,” Toyota wrote. However, Toyota does offer remanufactured parts but only for “selected mechanical parts,” not collision. Toyota calls them “remanufactured,” not Opt-OE, and they have both a warranty and a unique part number. “These are remanufactured by their original supplier or a Toyota approved supplier to Toyota quality specifications,” Toyota wrote. You can obtain them from “normal parts distribution channels,” which means the official Toyota network of dealers and suppliers. SCRS and Repairer Driven News’ queries focused on the nation’s largest OEMs. But just because we didn’t feature one here doesn’t mean the manufacturer lacks an Opt-OE program. However, we’d encourage repairers, suppliers and insurers to check with those OEMs before blindly buying a part listed as “Opt-OE.” We’d also encourage checking with the OEMs here to see whether or not the parts are warrantied; as the GM example indicated, this might not always be the case. We’d also encourage any other OEMs to contact us with similar details about what they do or don’t offer in the Opt-OE space. Email info@repairerdrivennews.com. True Opt-OE components can save customers money without straying too far from the genuine, new OE part ideal. Unfortunately, a body shop can’t always be sure they’re even getting the genuine Opt-OE ideal.